We recently completed a basic Local U seminar for bed and breakfast owners attending the MidAtlantic Innkeepers Conference in Baltimore. To augment the seminar I decided to create a large scale consumer survey using Google Survey as to how consumers find a B & B and what online resources that they use to do so. The survey mirrored the specialty lawyer survey that I conducted on behalf of Moses and Rooth last December. During the last week of February, 2013, we surveyed a representative sample of ~1300 American adult internet users that were 18 and older to better understand their behaviors when making a decision about choosing a B & B. The methodology created survey results with a margin of error of less than +/- 2.8%. 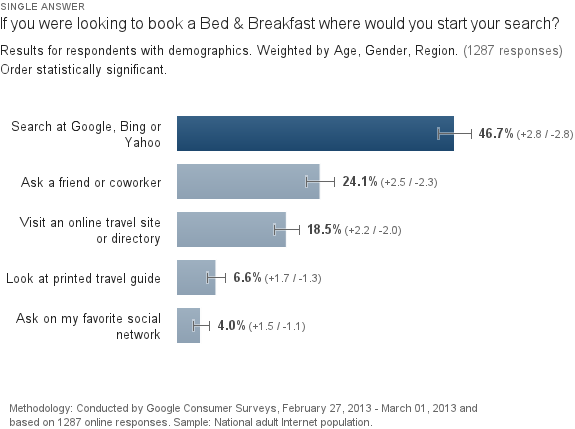 If you were looking to book a Bed & Breakfast where would you start your search? If you were to search for a Bed and Breakfast on the Internet what would be most important to you? If you searched for a Bed & Breakfast on Google, what would you do first? It seems self evident that the bulk of activity when looking for a bed and breakfast starts (and likely ends) at the search engines. The decline of print is articulated in these results as is the low usage of Facebook and other social networks. Like in the lawyer study, Facebook usage for this task was more than 10 x less than the use of search. More interesting to me is the apparent importance of “pimping out” your Google listing as searchers are much more likely to look the visuals and map at Google and at not just the reviews. One possible tactic suggested by the survey would the use interior StreetView to gain a visual edge in conversion optimization of the Google business listing. You can find the complete study at LocalU’s blog and download a PDF of the study there as well. These results offer an interesting contrast to the lawyer survey. To a certain extent these two industries are at the opposite ends of the local search spectrum. In one (the lawyer search), consumers need to develop knowledge about truly local resources while in the other (the B & B search) consumers need to develop knowledge about a distant local resource. The role of search and personal recommendations flip flopped between the two surveys. In the case of lawyers 54.6% would ask either a friend or another lawyer for a recommendation and 21.9% would start at a search engine. In the B & B search, 46.&% started their search at a search engine and 24% asked a friend. Actual usage of search engines is likely higher in both cases as the friends are unlikely to be a solid resource in either case and searchers are likely to move to over to using a search engine. Unlike in the legal search, consumers are much more likely to search for a B & B at other sites on the internet like of Tripadvisor or some other travel site. While there are equivalent legal sites their mind share is significantly less than the travel sites. Interestingly this behavior of using travel sites was much more likely to occur in those 45 and older. While those under 45 had a stronger preference for search. Previous PostSiri: When did you start working?Next PostVideo Snippets Vs. Author Images – Which Have Higher Click Through Rates? As a PI Attorney, I found this study quite interesting in comparison to the previous study to which it is compared. The results are also not that surprising to me. While I have not kept up an actual count, and I probably should, I would estimate that between 25% to 35% of our incoming calls from potential clients that found us through an online search are individuals that do not live in Atlanta (where we are based) or from Georgia for that matter. They were merely injured in Georgia. Thus they have no friends or relatives to ask for a attorney referral in Georgia. On the flip side, we receive a large number of calls from potential clients that live here in Georgia that were referred to us from friends, family or former clents. In other words, I would say my personal findings are right in line with the conclussions drawn from your two studys. As always, thanks again for the great post. Search is here to stay… and depending on the type of product, service or whatever it is we are searching for, will be different sources and in my opinion, that’s a good thing. Just make sure your site is Mobile Friendly (shameless plug).